We keep hearing about the pending launch of Google Drive, the company’s cloud storage service that will support Android and iOS devices. Most recently, the word on the street is Google could make things official as soon as next week. It’s seeming increasingly likely that the company will have to acknowledge Drive sooner or later, as yet another Drive leak has come out, and this one in a very public fashion. We’ve already seen screenshots from users who claimed to have early access to Drive, showing-off the service’s PC interface. 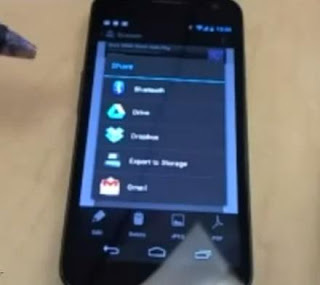 Around the same time, we also got a look at what was supposedly the Drive icon, a three-color folded triangle design. 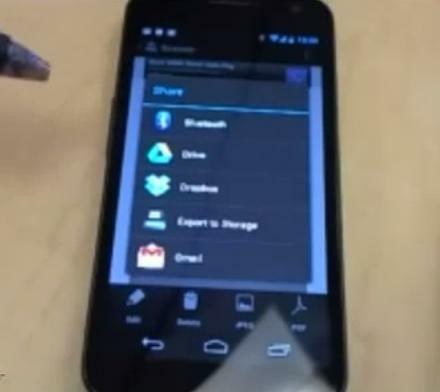 During Friday’s Android Developers Hangout video, while showing some features on his phone, a Google employee pulled-up a list of sharing options, including none other than Google Drive, complete with that icon. Google quickly reacted by taking the video down, but not before it could be archived. Lets see wht its going nxt from google !!!!!!!!!!! !